I love these socks :) They are quite a bit longer than I am used to knitting (in the cuff), but I followed the pattern exactly (7 repeats) and they stay up on their own and aren't stuffy like other (machine made) long socks I have. I shy away from knitting longer cuffs on socks, always afraid of the yarn running out, but with the Lisa Souza Sock!, I had no such worries. I have 36 gm left over as well! More than enough for a generous pair of toddler socks. I love when vendors are generous with their skein size; I love so many patterns in Knitting Vintage Socks and Knitting on the Road, but they often call for 1.5x the amount of yarn I usually earmark for socks (3 50gm skeins instead of 2; 2 100gm skeins instead of 1, etc. ), so as I like the longer cuffs, I think I may start turning my attention to the vendors that are more generous with their skein sizes... so Cherry Tree Hill instead of Koigu, more Lisa Souza, Schaefer Anne (ooh, the new Toni Morrisson colorway at Little Knits!!) and Socks That Rock (like I need an excuse!) etc. As I said, I followed the pattern exactly and had a great time with it. I put down my chart after knitting a few repeats (I charted the pattern for my own use, I prefer them so much now!) and I am feeling more and more confident in "understanding" lace progression, even if it is just simple lace on socks. I did also use US 2's instead of US 1's as the pattern called for; I got gauge (8 sts=1") on the 2's though I think I preferred the fabric I got on the US 1's (9 sts=1") with this sock yarn. I'm glad I went with the 2's in the end though, both b/c the socks fit quite well and b/c the fabric bloomed in the wash, though still isn't as "tight" as US 1 fabric would be. These pics were actually taken after the socks had been thru the washer/dryer-- I wore them this weekend and didn't take pics. I'm glad I went ahead and washed them before writing about them, as I am quite pleased how the yarn softened and bloomed in the wash. I didn't split the yarn when knitting, but at times could see the 3 plies on my needle as separate (not tightly wound together). I notice this more in the wool/nylon yarns I've tried, and its not a complaint-- but it is like the other wool/nylons in the easy separation of the plies and noticable softening after a wash. The colorway is perfect for me too... I purposefully picked out a skein at Stitches that was more touched with orange; other skeins in the same colorway may have been darker with more black or blue, but you know my fascination with orange. I was planning on having these done for March, but left my knitting in the car that night as I tried to knit in the dark. I dropped too many sts as I drove past the Coliseum and decided to put it away, hidden well enough to forget to knit thru the last day of March. Wow! Your socks look great! And all the information you gave is so helpful, thanks. They look good! I'll have to try that pattern. I'm glad to see how it looks in a multi colored yarn. Those socks are absolutely wonderful, and the colour is fantastic. I love them. Gorgeous socks! That pattern really shows off the yarn. Nice socks! Love the colors in that yarn. 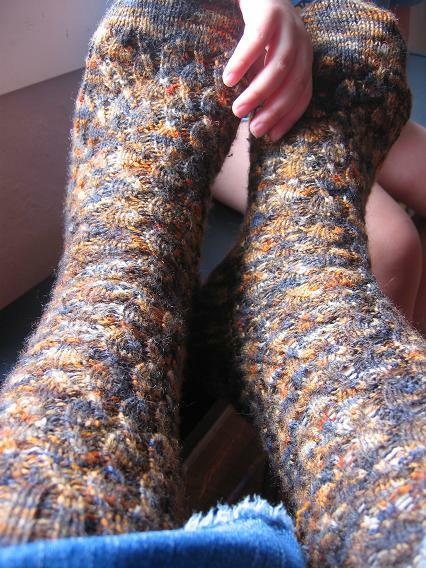 Your socks are always so gorgeous - you definitely know how to match yarn and pattern! I love them. 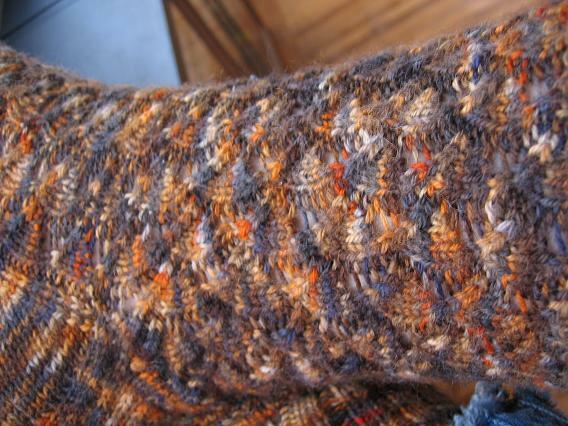 The yarn is beautiful as is the pattern. Great job! Love those socks and the pattern. 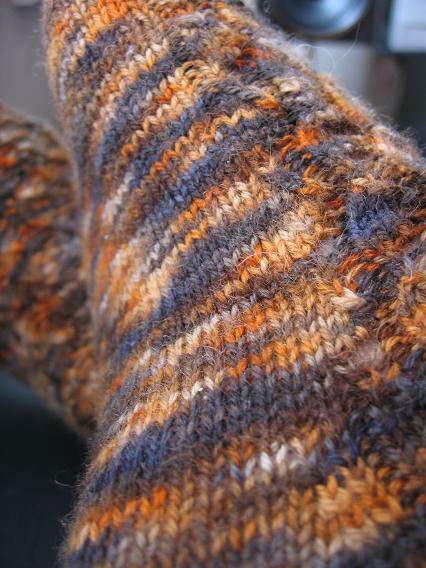 I'm knitting socks in Lisa Souza's Petroglyph and Socks That Rock, both good yarns. I want to try Lisa's Sock Merino next. Your socks look great! I just got that book the other day and have been eyeing (or is it eying) that pattern. Great job! They look great! I really like that colorway!